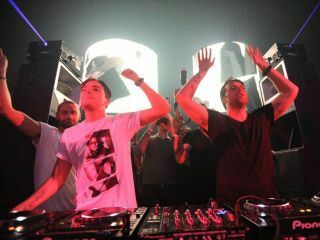 Alesso (left) and Sebastian Ingrosso could soon be playing in your house, so do make sure you tidy up. In what's being billed as a Spotify first, Swedish House Mafia's Sebastian Ingrosso and producer/DJ Alesso are set to play a live DJ set on the platform via its Soundrop app. Kicking off at 19.00 BST on 1 June, this will involve the two DJs sharing some of their favourite songs in a special room within Soundrop. The set will include their new single Calling (Lose My Mind), which will be released on 27 May. Fans will be able to vote on which tracks should be played next, while Ingrosso and Alesso will be chatting to the crowd, too. Commenting on the house party, Sebastian Ingrosso says: "We're really excited to be giving all of our fans the chance to hang out with us and listen to some cool music in Spotify." "We hope that our fans will kick their evening off with us, and then continue all night long," Alesso adds. You can join the event on Facebook now.